This is an article from Mercola.com. I found it interesting because I never use sunscreen or put it on my kids. I never believed the hype about it. When I told people I don’t use sunscreen or use it on my kids I was told I was crazy. Well this story proves my point. Researchers at the Environmental Working Group, a Washington-based nonprofit, released their annual report claiming nearly half of the 500 most popular sunscreen products may actually increase the speed at which malignant cells develop and spread skin cancer because they contain vitamin A and its derivatives, retinol and retinyl palmitate. Furthermore, the FDA has known about the dangers of vitamin A in sunscreens since ordering a study 10 years ago, but has done nothing to alert the public of the dangers. Also, be careful where you discuss the danger involved with sunscreens. Brazilian supermodel Gisele Bundchen has reportedly “infuriated cancer experts” by describing sunscreen as “poison”. Bundchen, incidentally, is currently the highest paid supermodel in the world. She also has said that it should be against the law for healthy mothers to give their baby infant formula full of sugar, and often soy. The FDA is once again on the wrong side of consumer safety, just as they have been time and time again when they allow dangerous drugs onto the market that end up killing people and are later recalled. Failing to alert consumers of the dangers of vitamin A and its derivatives in sunscreens falls in line with the FDA’s seemingly endless ability to protect their big business “clients” at the expense of public safety. In this case the manufacturers of sunscreens are the beneficiaries of the FDA’s inability or unwillingness to publish their own vitamin A safety research that they conducted over 10 years ago in 2000. For a long list of other FDA debacles through the years, just put “FDA” into my search box at the very top of this, or any page at mercola.com. Is Sunscreen Really a Necessity? Let’s consider a question that naturally arises out of this latest failure by the FDA – do you even need to use sunscreen in the first place? The answer is “maybe”, and only when you can’t control how much sun you are exposed to. For instance, if you work outdoors all day as part of your job, or if you need to protect sensitive areas of your face, like around your eyes, that are particularly susceptible to photoaging and not that large a surface area to impact vitamin D levels if blocked with sunscreen. But you certainly don’t want to use most of the commercially available sunscreens under any condition as they not only block your body’s ability to produce vitamin D, they’re also loaded with toxic chemicals. More about that in a minute. However, sunscreens available in most health food stores, and the one we sell on our site, are safe to use when the need arises. The fact is, getting safe sun exposure every day is actually one of the best things you can do for your health. Sun exposure allows your body to naturally produce your own supply of vitamin D, and experts agree that this is the best form of vitamin D available. The point to remember is that once your skin turns the lightest shade of pink (if you’re Caucasian), it’s time to get out of the sun. Past this point of exposure your body will not produce any more vitamin D and you’ll begin to have sun damage. And sunburn anywhere on your body is never good for your health. First of all, vitamin D plays a crucial role in your overall health and well-being. If you’ve spent any time on my site at all, you know that I’m a firm advocate for optimizing your vitamin D levels. The key is to find a healthy balance between getting enough natural sunlight to maximize your vitamin D production and maintain your optimal health, while at the same time protecting yourself from damage that occurs from overexposure to the sun. One such study revealed that melanoma patients who had higher levels of sun exposure were less likely to die than other melanoma patients, and patients who already had melanoma and got a lot of sun exposure were prone to a less aggressive tumor type. Another Italian study, published in the European Journal of Cancer in June 2008, also confirms and supports earlier studies showing improved survival rates in melanoma patients who were exposed to sunlight more frequently in the time before their melanoma was diagnosed. Also, Melanoma is actually more common in indoor workers than in outdoor workers, and is more common on regions of your body that are not exposed to the sun at all. Additionally, UVB radiation has been found to delay the appearance of melanoma if you are genetically predisposed or prone to skin cancer. Ultraviolet light from the sun comes in two main wavelengths – UVA and UVB. It’s important for you to understand the difference between them, and your risk factors from each. Consider UVB the ‘good form’ that helps your skin produce vitamin D.
UVA is considered the ‘bad form’ because it penetrates your skin more deeply and causes more free radical damage. Not only that, but UVA rays are quite constant during ALL hours of daylight, throughout the entire year — unlike UVB, which are low in morning and evening, and high at midday. If you’ve ever gotten a scorching sunburn on a cloudy day, you now understand why; it’s from the deeply penetrating UVA! Since UVA’s are inherently more damaging AND persistently high during all daylight hours, wearing a sunscreen that doesn’t protect you from UVA is going to give you virtually no benefit, and be detrimental to your overall health. So the first thing to understand about using sunscreen, when applicable, is to make certain you are actually getting UVA protection. One of the best strategies to protect yourself from the sun is actually not a sunscreen at all, it’s wearing clothing or getting into the shade. Because most sunscreens are loaded with toxic chemicals that can actually accelerate skin cancer, or get into your bloodstream where they can disrupt your hormones. 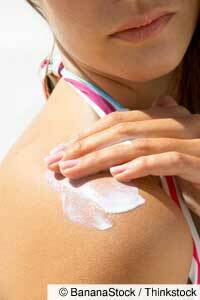 Also, the protection sunscreen manufacturers claim is often misleading due to improper application. So you don’t always need to apply sunscreen, and you definitely do want to get some safe sunlight exposure every day, which has also been shown to help protect against as many as 16 different types of cancer, including; breast, colon, endometrial, esophageal, ovarian, bladder, gallbladder, gastric, pancreatic, prostate, rectal, and renal cancers, as well as non-Hodgkin’s lymphoma. Cotton clothing provides about SPF 15, in other words, you will get about 15-times your skin’s normal protection from the sun wherever you cover your body with clothing. Just remember that even with protective clothing on your body, it’s still important to monitor your skin for the telltale signs of burning. Remember, sunburn provides no benefit, and is never good for your skin. So is Gisele Bundchen Right? 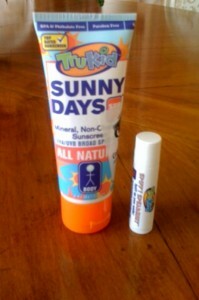 Until very recently all sunscreens did NOT filter out the UVA radiation. They filtered out UVB, ensuring that your body could not make any vitamin D, while letting the UVA through. So there was a strong recommendation from the medical community to use sunscreen, but this advice was actually increasing your risk of cancer while eliminating your body’s ability to manufacture vitamin D! The other issue is what type of chemicals does the sunscreen use to create the barrier against the UVA waves? The synthetic chemicals often used in sunscreen preparations can get into your bloodstream and can cause all sorts of unwanted toxic side effects, including hormone disruption. So if Gisele was referring to sunscreens containing these hormone-disrupting synthetic chemicals that do not even protect against UVA rays, then she was absolutely right! However, options do exist to provide safe protection from the sun during times when you may not be able to control the amount of sun exposure you are likely to receive. For instance, if you take your kids to an amusement park or the beach, you might just be in direct sunlight all day. To get natural sun protection from both UVA and UVB rays, you will want to use a sunscreen product that contains the active ingredients of titanium dioxide and zinc oxide. My research team has put together what we think is superior sun protection and you can find more about it here. You want to be cautious not to include any vitamin A in your sunscreen, or its derivatives retinol and retinyl palmitate. This conclusion came from Environmental Working Group’s analysis of the findings released the FDA and the National Toxicology Program. Why hasn’t the FDA released these findings and alerted the public to the possible dangers of using a sunscreen that includes vitamin A or its derivatives? No one is really certain why the FDA again refuses to listen to its scientists and doctors. But this type of behavior has become standard operating procedure for the FDA, an agency that routinely protects the business interests of corporations instead of following their stated mandate to protect the public health. Our sunscreen used to have vitamin A in it until I discovered its potential health problems. We immediately removed it, however many other brands still include it in their formulas, so beware, and always check the labels when shopping for sunscreen. Thanks to the Environmental Working Group, you are now able to see exactly how your sunscreen rates for safe ingredients and efficacy. 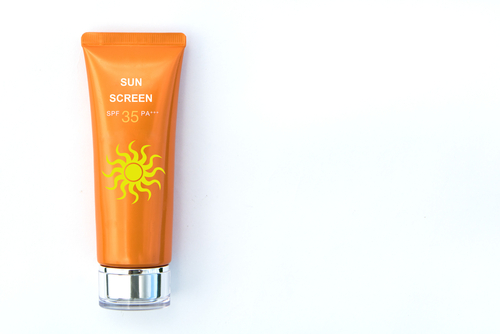 Check out EWG’s Sunscreen Guide here. Their website also lists the titanium and zinc containing sunscreens receiving the highest ratings, as well as provides you with some non-mineral options that rank lowest on the toxicity scale. The site is also a great reference for surprising facts about sunscreen, and also contains a sunscreen hall of shame, showing the absolute worst offenders on the toxicity scale. And lastly, according to their website, 1 in 8 sunscreens sold on the market today still offer no protection against UVA rays! Yes, a specific nutrient has been identified as being profoundly useful in protecting against sun damage! Astaxanthin has recently jumped to the front of the line in terms of its status as a “supernutrient,” becoming the focus of a large and growing number of peer-reviewed scientific studies. It’s produced from marine algae in response to exposure to UV light. This is the way the algae protects itself, so it makes perfect sense that this deeply pigmented substance would have the capacity to “shield” you when it is taken in large enough quantities for a long enough time to saturate your body’s tissues. Typically this is several weeks. One of the benefits of astaxanthin that has piqued the interest of researchers is its ability to reduce signs of aging, by helping protect your skin from sun damage. Cyanotech Corporation funded a study through an independent consumer research laboratory to measure the skin’s resistance to both UVA and UVB light, before and after astaxanthin supplementation. After taking 4mg per day for two weeks, subjects showed a significant increase in the amount of time necessary for UV radiation to redden their skin. In 1995, hairless mice were fed various combinations of astaxanthin, beta-carotene and retinol for four months. After irradiation, astaxanthin alone or in combination with retinol was substantially effective in preventing photoaging of the skin (as measured by markers for skin damage). In a 1998 study with rats, astaxanthin was found to be 100 times stronger than beta-carotene and 1000 times stronger than lutein in preventing UVA light-induced oxidative stress. The Journal of Dermatological Science published a study in 2002 finding astaxanthin is able to protect against alterations in human DNA induced by UVA light exposure. Controlling your exposure to the sun is not always possible, and sometimes even the most vigilant of us forget to bring along the proper natural sunscreen when we face overexposure. So what’s the best way to ensure your body is primed to have the best defense against overexposure to the sun’s harmful UVA rays? Consuming a healthy diet full of natural antioxidants has always been a useful strategy in not only staying healthy but also providing your body with the resources to counter damage from exposure to ultraviolet radiation. Fresh, raw, unprocessed foods deliver the nutrients that your body needs to maintain a healthy balance of omega 6 and omega 3 oils in your skin, which is your first line of defense against sunburn. If you are regularly consuming processed foods and your cells are loaded up mostly with damaged, oxidized fats, you simply aren’t giving your skin the proper fat protection it needs at a cellular level. Fresh, raw vegetables also provide your body with an abundance of powerful anti-oxidants that will help you fight the free radicals caused by sun damage that can lead to burns and cancer. You can also make sure to wear a cap with a visor to protect your face and eyes from direct sunlight, along with enough clothing to protect your skin from direct sun contact. Most cotton clothing will provide you with about 15 SPF. Also, I avoid using sunglasses, because I believe your eyes need to receive the full spectrum of light to function optimally, and sunglasses block out some essential waves of the light spectrum. So as you’re getting your healthy and necessary daily exposure to direct sunlight to optimize your vitamin D levels, you want to be sure to leave the sunglasses behind.